The "blue marble" view of Earth was first captured by astronauts during NASA's Apollo 8 mission on Dec. 24, 1968. Today (April 22) is the 45th anniversary of Earth Day, and NASA has a series of activities planned to celebrate the beauty of our home planet. 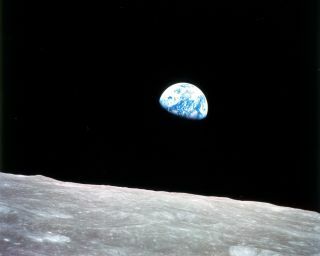 NASA astronauts are given some credit for the origins of Earth Day, as the pictures they take of our planet from space – particularly a famous Earthrise-over-the-moon photo by the Apollo 8 crew in 1968 – showed Earth as a delicate blue marble in space. Below is a list of the many ways that NASA is celebrating Earth Day. No matter where you're standing today (April 22), NASA wants you to share your favorite views of Earth. Hashtag your image or video with #NoPlaceLikeHome and post it to Instagram, Twitter, Google+ or Vine. Alternatively, you can post the video or picture to event groups on Flickr and Facebook. More details are available at www.nasa.gov/likehome. At Union Station's main hall, NASA is exhibiting science, providing hands-on activities and doing science demonstrations for the public between 10 a.m. and 5 p.m. local time today (April 22). Several NASA scientists will also talk at the Hyperwall stage after 11 a.m. Delegates will include Ellen Stofan, chief scientist at NASA, and John Grunsfeld, associate administrator for NASA’s science mission directorate. At Dulles International Airport's A Gate AeroTrain Station, NASA will show off a gallery of large-format satellite images. The pictures come courtesy of the agency's fleet of Earth-observing satellites. The gallery opened on April 16 and will run through May. Today (April 22) between 10 a.m. and 2 p.m. PDT (1 p.m. and 5 p.m. EDT), theNASA Ames Research Center will host an exhibit on earth science research as a part of the U.S. Army Reserve’s 63rd Regional Support Command Earth Day Fair free family event. The event takes place at 230 R.T. Jones Road, Mountain View, California. Between April 25 and 26, from 9 a.m. to 5 p.m. PDT (12 p.m. to 8 p.m. EDT), NASA's Jet Propulsion Laboratory will have an exhibit at the Aquarium of the Pacific's Earth Day Festival. The event takes place at 100 Aquarium Way, Long Beach, California.